No, it’s not a new member of the Flight of the Conchords group, which already include performers with the pseudonyms of the Hiphopopotamus and the Rhymenoceros. No, the Kangahippomouse is the thing above. Mark Frauenfelder has blogged an entry entitled “Mystery creature photographed in Seattle — a kangahippomouse?” over at Boing Boing. Mark is looking for help in identifying it. My first thoughts ran to that of the naked mole rat (Heterocephalus glaber), also called the desert mole rat or the sand puppy, but they are only found in East Africa, naturally. Naked mole-rats live in underground dwellings in Ethiopia, Somalia, and Kenya. Why worry about al Qaeda, when the naked mole rat may be coming into our country? Could our own military have brought back some and then one escaped in the Seattle area? Humm? I don’t know, it might be one from their routine colonies of 100-300 members. But the naked mole rat’s ears look a little flat or shorter, in comparison to the Boing Boing Mystery Animal’s ears. How about a wombat with mange? Why not, you might say, even though Australia is a long way? Nope, they are not a good match. (Poor critter looked in pain.) But I like the sound of the name “wombat,” so it was worth a pull out of the hat. Naked mouse, a rodent with mange, a naked mole rat, a black squirrel waiting for its Bigfoot costume to be fitted, an otter out of line and without hair – what is it? Think about it. Iraq is having trouble with those nasty honey badgers or ratals. Why shouldn’t Seattle be invaded by naked rats? But seriously, any ideas what this strange animal is? This entry was posted on Tuesday, July 17th, 2007 at 12:01 am and is filed under Breaking News, Cryptotourism, CryptoZoo News, Cryptozoologists, Cryptozoology, Media Appearances, New Species, Out of Place, Photos, Pop Culture. You can follow responses via our RSS 2.0 feed. You can skip to the end and leave a response. Pinging is not allowed. Otter, gotta be an Otter, yea that’s it, an Otter. I’d never heard of a mountain beaver before but after looking at pictures of them, I change my vote from squirrel to mountain beaver. The ears and short torso are clearly a match, where some of the other candidates didn’t match either, the squirrel at least matched the ears and general head shape, but the short torso and apparent taillessness didn’t…Mountain Beaver it is… With Mange or something. The hind feet look like those of a squirrel. Hmmm…..okay, so I Googled “mountain beaver” in images, and what do you know….the feet also look like those of a mountain beaver. It’s definitely NOT a rat. I have had pet rats for years, their bodies and faces are sleek and pointed, this thing is chubby and rounded. It’s not supposed to BE hairless, the clumps of hair still on it suggest to me a diseased animal that SHOULD have hair. Hi everyone. If you look very closely this animal is eating at the base of a dandilion plant. It has to be very small, no bigger than three to five inches in length. It also has all the features of a hampster, but none of the fur. Also if you use the magnification tool on your desktop, you will see very black fur, which rules out beaver or otter on both counts, on the patches that are still on its back. The paws and feet are exactly the same, as well as the ears and as well as the little stub of a tail you can see at the hind end of the animal. I would say this is a young hampster of some kind with mange that has escaped someone. If you have ever had hampsters like I have you would know just how easily they do that too. Good luck everyone. 1.) Other than it being at a weird angle and standing a little more hunched than normal it LOOKS just like a rat. 3.) It’s size, it does look a little larger than a typical pet rat, but that’s not abnormal in itself. I had a friend with some tail-less rats that grew to about 3lbs each, they were monstrous, he fed them dog food. 4.) The head shape is a little off from a typical rattus norvegicus, but is perfectly in line with a “dumbo” rat (see link below). “Dumbo” rats have a genetic variation that causes them to have more prominent skulls with ears more on the sides of their heads than on top like normal rats. Rats that are “dumbo” are also typically considered so calm that they’re almost described as “comatose”, so that would also explain why this thing let the photographer get so close. Even though I’m convinced it’s just a pet rat I am still intrigued. Somehow this rat ended up being a hairless, possibly tailless, dumbo rat. Three genetic variations that you don’t usually see. So it’s still an amazing creature. From its body shape and its short tail, I think it is a marmot with mange. Darkshines- You’ve obviously never seen a fat rat. I used to have snakes and they ate rats, and some of these rats were very pudgy and rounded precisely as this one is. We have rats running around here in Tokyo that are every bit this fat. 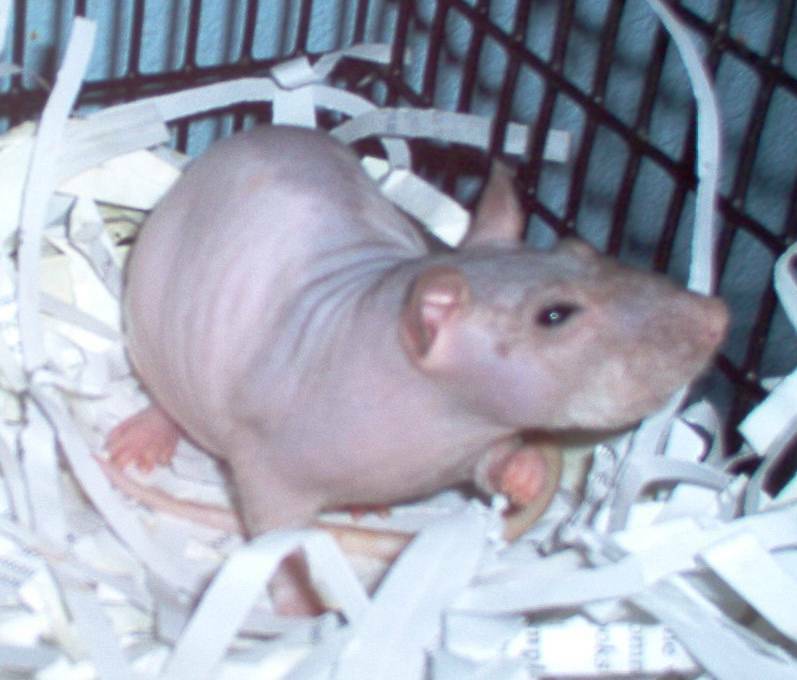 Look towards the bottom of the list of photos I posted a link to above and you will see clear examples of hairless rats this fat as well as clear examples of hairless rats with tufts of fur like this. I do not believe it has mange. Look at the example of the wombat. Look at how nasty the skin looks. It’s flaky, dry, cracked..just NASTY as mange is. We are breeder dogs and mange dose not leave a critter with smooth supple skin like our subject has. It is all genetics as to why it is hairless. I believe most of us think it is a rodent though. Many of the rodents look so much alike it’s just hard to tell which rodent it is. Hard to get a grip on it’s size and at that angel it’s hard to tell about the muzzle…for me anyway it is. Thanks for the info. I stand corrected. This very well could be a Mt. Beaver. The only thing is I didn’t see any hairless ones when I went to Images. Are their hairless ones. And just so every one knows as I’m sure you all do. Mange isn’t the only thing that will make an animal lose its hair. I have 5 English Bulldogs and 2 of them are losing their hair. The vet isn’t sure what it is. But he says it definitely isn’t mange. He thinks it might be (I’m sure I’m gonna spell this wrong but) he thinks it might be alopicia. He said it also might be just their diet. I think it’s alopicia. Cuz none of my other Bullies are losing there hair. Anyway, I’m still up in the air on this one. It’s a Nutria and it’s been on the local news in Seattle several times. Nutrias are in the beaver family and are indigenous to Asia. They are causing a lot of problems with the wetlands around here and no natural predators to control the population. Darhop: You are correct. Alopecia can occur in many dogs, perhaps in rodents too. You may be on to something. It’s not a nutria. Nutria have long, skinny tails, slightly webbed feet, and completely different ears. Aurorasunlight is right. Unless they’ve imported dandelions the size of shrubs to Seattle since I lived there, this is a small animal. Much too small for a nutria, a marmot, and maybe even a rat. That leaves a bunch of other tiny mammals that would be native to the area, like voles, moles, and other field rodents. Just imagine them naked, and take your pick. This is a Pocket Hippo, AKA a Baldwin hairless guinea pig or Skinny pig. If you go to this link you will see several pictures of different animals which several look like the one in the picture. In person the all grey ones look like miniature baby hippos. Through me for a loop when I first saw one. This looks like a raccoon baby. I raised 3 of them & that’s pretty much what they look like when they are soooo young. Maybe only a few days old. It is definitely a baby nutria except that they are usually born fully furred. However is may be a genetic mutation or most likely someone shaved the poor thing. It definitely has all the anatomical features of a Nutria. If you don’t agree look at the back foot that is visible and the shape of the head then google a picture of a Nutria. It’s a match. It’s a squirrel. Just look at the ears. Very very sick squirrel. It’s front paws are way to big in ratio to it’s body to be a rat. Given that squirrels have large populations where the photo it just makes sense. It’s posture, head shape, ears, feet and hands all point squirrel. I’d also think certain marmots or chipmunks might also fit the bill….but doubtful. There is another photo available from which this photo was cropped. It shows just how tiny this creature is compared with dandelions and other vegetation. I found it at the Fortean Times web site. Sarcoptic mange does not usually leave the skin crusted and thickened like demodectic mange does. The animal in this photo is not hairless all over; tufts of hair are plainly visible, in areas where it would be difficult for the animal to reach to scratch. This little guy’s tail doesn’t look long enough to be a nutria, but I suppose it could be one. It still looks like a marmot to me, but nutrias look a lot like marmots too :). Whatever it is, it certainly appears to have a bad case of sarcoptic mange. DARHOP: All I can say is “Doh!” I pasted the incorrect link before. Those are indeed hairless guinea pigs, and as you can see the size of the ears in relation to the rest of the head seems larger in most of these, compared to the subject of this discussion. Here is (really) a page with a couple of pictures of a hairless hamster – note the stubby tail apparent in the second pic- which to me it looks more like our kangahippomouse than some of the other possible suspects. RAT – it was, as DARHOP pointed out, a link to a hairless rat photo that I offered before, and NOT guinea pigs or hairless hamsters. Sheesh. I should be doing this earlier in the day when I still have some semblance of focus, LOL. I still vote hairless hamster. It’s gotta be a hairless squirrel-tt’s far too smooth for a mole-rat and those feet are a dead giveaway. Ok, can’t be a beaver or squirrel, the tail doesn’t fit. Even an alopeciac beaver would still have a big flat bald tail, and a squirrel a long skinny bald one. I’d say baby nutria. The anatomy fits and the fact it’s *there* and didn’t scamper away from somebody taking a picture of it may indicate it’s young. Or sick with mange. Either way it’s pretty gnarly lookin’. it looks like someone shaved its hair and took a photo of it to fool people, and apparently did a good job of it too.